Home > Resources > Transfer > How to Transfer SMS from iPhone to Sony Xperia? Have an old iPhone, like iPhone 4 or 4S, for a few years, and now you just want to change to Android system so you purchase a brand new Sony Xperia Z5. Unfortunately, all your private information, such as text messages are all trapped on your old iPhone. You need to copy them all to your new Sony Xperia Z5 so that you can give away your old iPhone without the possibility of privacy exposure. In this article, we recommend you an easy solution to make it. A professional phone to phone data transfer tool can free up your hands in transferring data manually one by one. Coolmuster Mobile Transfer is what I want to introduce here to transfer overall text messages from iPhone to Sony Xperia easily with 1 click. 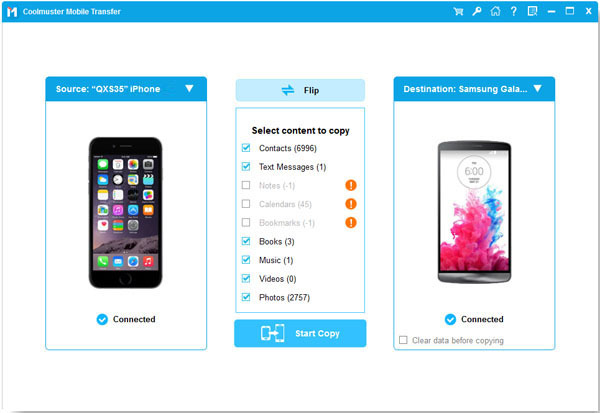 Besides SMS messages, it also copies contacts, photos, videos, music, apps, etc. from iPhone to Sony Xperia, and vice versa. It is compatible with Sony Xperia XZ Premium/XZ1/XZ5/XZs/XZp, Samsung Galaxy S9 Plus, S9, S8, S8 Plus, S7, S7 Plus, S6 Edge, S6, S5, S4, S3, Note 8, Note 7 and more and iPhone X, 8 Plus, 8, 7, 7 Plus, 6S, 6S Plus, 6, 6 Plus, 5S, 5, 4S, 4, 3GS, etc. The trial Windows or Mac version of the Mobile Transfer are provided for you to download according to your need. The following is the guide on how to transfer SMS from iPhone to Sony Xperia by using the software. 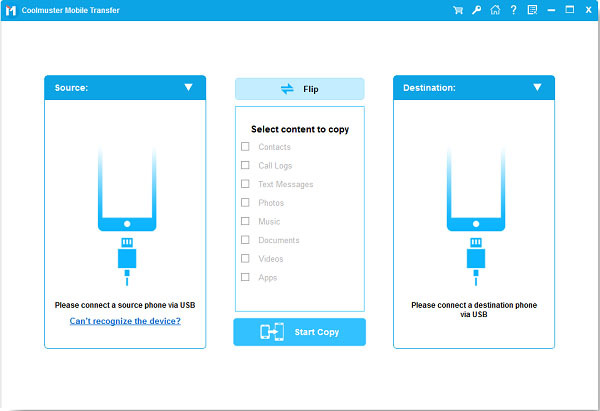 Download and install the Mobile Transfer software on your computer. After that, launch it and you will see the main interface as the below picture. Please connect both of your old iPhone and new Sony to the comuputer simultaneously by two USB cables. Once the two devices are detected by the program, it will display them in the primary window. As you can see, the data you can transfer are all listed on the above. Only check the "Text Messages" tab if you just need to move text messages. Now, click the "Start Copy" button to do the job of SMS transferring from iPhone to Sony Xperia. Note: Don’t disconnect your phones in the whole process.